LOUDONVILLE, N.Y. — Trailing by 10 at halftime, the Canisius men’s basketball team outscored Siena 40-26 in the second half to post a 70-66 come-from-behind victory Saturday night at Times Union Center in Albany, N.Y. The win, the Golden Griffins’ second-straight and fourth in their last six outings, improved the team to 5-8 overall and 2-0 in MAAC play, while Siena fell to 5-10 overall and 0-2 in conference action. The win moves Canisius to 2-0 in MAAC play for the second-straight season and for just the seventh time since joining the conference before the 1989-90 academic year. This is just the second time the Griffs have opened MAAC play with two wins on the road, with the other occasion being 2012-13. Canisius sophomore Takal Molson scored a game-high 23 points in the win for the Griffs, one of three Griffs to post double-figures in the scoring column. He also pulled down eight rebounds, one of three Griffs to record eight boards in the victory. Junior Isaiah Reese added 20 points, eight boards and a season-high five steals, while sophomore forward Scott Hitchon added 11 points four boards and two blocked shots. Canisius shot 45.5 percent from the field in the win, highlighted by a 50.0 percent effort in the game’s second half, while making just three 3-point field goals in the victory. The Griffs also shot 77.3 percent from the free-throw line and out rebounded the Saints 39-33 for the contest. Canisius, which trailed by as many as 15 points in the first half, went into the locker room down 40-30 after Siena made nine 3-point field goals in the first half. The Griffs led the game 8-6 early, but a 26-9 Siena run, fueled by six 3-pointers, made the score 32-17 with 6:44 left before halftime. Canisius whittled that lead down to seven at 37-30 after Molson hit a pair of free-throws with 90 seconds left before the break, but a 3-ball from Kadeem Smithen with 1:13 left in the opening stanza gave the Saints the 10-point cushion at halftime. A Siena lay-up just 3:00 into the second half put the home team up 47-37, but Canisius stormed back on the power of a 16-4 run over the game’s next 6:48 to make the score 53-51 in favor of the Blue and Gold. In that run, Molson accounted for seven points and Hitchon added six, highlighted by a lay-up off with 11:57 left to play that gave Canisius its first lead since the scoreboard read 8-6. Siena answered with five-straight points, including a 3-point field goal from Sloan Seymour, to regain the lead at 56-53 with 7:45 left on the clock, but a bucket by Reese and four-straight points from sophomore Jalanni White gave the Blue and Gold the lead back at 59-58. Reese followed moments later with a driving lay-up to make the score 61-58 in favor of the visiting team. Another 3-point make by Seymour with 40 seconds left put Siena down one at 64-63, but four free-throws by Reese and two more from Molson in the game’s final 23 seconds sealed the win for Canisius. The Saints hit a late 3-pointer as the final horn sounded to close out the game’s scoring, as the Griffs moved to 3-1 on the season in games decided by five points or less. White ended the night by matching a career-high with his eight points, and he set a new career-high with eight rebounds. He also recorded two assists and two blocked shots. The Griffs ended the night with a season-high 42 points in the paint, and the Blue and Gold scored 10 second-chance points thanks to eight offensive rebounds, with six of those boards coming in the game’s second stanza. 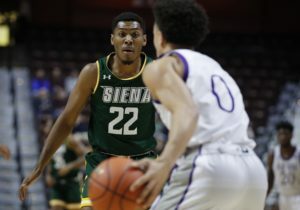 Siena was led offensively by senior Evan Fisher, who scored a team-high 21 points in the loss. Siena freshman Jalen Pickett (Aquinas) posted a double-double with 14 points and 11 assists while committing just one turnover. Seymour scored 15 points after hitting five 3-pointers. Saturday was the 101st all-time meeting between the two schools, with Siena leading the series 54-47. The win at Times Union Center is the seventh for the Griffs in 27 all-time games against the Saints in their downtown building and the second in the last three seasons. Canisius had two players (Molson and Reese) score 20-or more points in a game for the first time this season. The last time the Griffs had two players with 20-or more in a contest was Feb. 18, 2018 at Rider when Jermaine Crumpton scored 24 points and Reese added 23. The 23-point effort is Molson’s fourth 20-point effort of the season and the 10th in his career. Reese has now scored 20-plus in 12 times in his career. Molson extended his streak of scoring in double-figures to 17 games, dating back to last year. Reese’s season-high five steals allowed him to move past Canisius Sports Hall of Famer Brian Dux for 10th all-time in career steals. Reese now has 141 steals to his credit. White played a career-high 29 minutes in the victory. Junior Malik Johnson made his 80th straight start for the Griffs, which is every game since he joined the program prior to the start of the 2016-17 campaign. Canisius will close out the non-league portion of its 2018-19 schedule on Tuesday, Jan. 8, when the team hosts Brown. Game time in the Koessler Athletic Center is set for 7 p.m. That contest will be broadcast on ESPN+, with the radio call available on WECK-Radio Buffalo, GoGriffs.com and the TuneIn app.